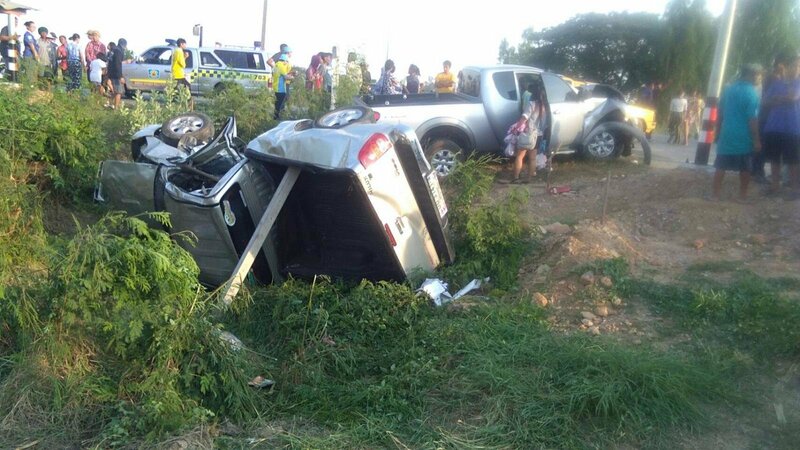 Police were alerted to the accident on the Bang Li-Nong Wan Priang road in Tambon None Phra Prang, Song Phi Nong district at 12.15am. Police said the car driven by Nitikorn Doktalyong, 22, hit the rear of a 10-wheel truck parked on the roadside. The truck was not obstructing the left lane so police believe the driver fell asleep behind the wheel, causing his car to stray on to the hard shoulder. Nitikorn’s five-year-old nephew died at the scene while his one-year-old niece died after being rushed to the district hospital. Nitikorn was injured along with two relatives, identified as Rinda Udom, 21, and Worasuda Chantharang, 15. Pol Maj Phawit Preenakhon, inspector of the Song Phi Nong police station, said Nitikorn and relatives were returning home in the district after driving their friends to Kanchanaburi following Songkran celebrations in Suphan Buri. Hard to keep finding the words isn't it...another idiot steals 2 lives before they even start...how can he live with himself? Any check for alcohol with "dozing" driver? Even if he showed low alcohol levels that doesn't mean he didn't fall asleep at the wheel because was partying all night (or several nights). Note :: only 22 years old driver !!! how much experience in driving a car!!!! In countries where you have to take many hours of tutored driving lessons before qualifying for a driving test, then sit a written exam it's still daunting when you first drive solo. Thailand all you do is watch a video pay the fee & go on the road all within one day. Zero experience which equates to the daily death toll, add drink/drugs into the mix & you get the sorts of figures that get you the number one spot for all the wrong reasons. But this is Thai culture... make life easy for everyone not harder by having to train & qualify to a standard before you drive. Hes a Thai, and there will be very little morse shown . Sleep with the Angels little babies. Again no mention of seatbelts. It's called remorse ..... and I believe you are incorrect. He will be remorseful, he will never forget this day ever, he will end up at the temple and he will be reminded by the parents everyday of this tragic event and how he took their babies away. His life will be one of solace and solitude. Police said "THEY BELIEVE THAT HE DOZED OFF" THAT must be enough evidence for them!!! Otherwise MORE PAPERWORK required for breathalyer checks....!! the video shows ALL THAIS how to drive !!! then they get on the road and forget what they have watched. Drinking till 3 AM then seat behind the wheel at early morning. Fall asleep in result. Its not rocket science. If a vehicle drifts off the road WITHOUT skid marks ...what does that tell you?